We pride ourselves in being a forward-thinking Veterinary Hospital, so back in March 2014, we started offering “Cat-Only Clinics” on a Tuesday afternoon at our Stanhope Road surgery. This gave clients with more anxious or nervous cats the opportunity to see a vet at a time when no dogs would be in the consulting area of the practice, as it is now well-recognised that dogs are one of the major stressors for cats. Whilst we had success with running our cat-only clinics, we understand that our clients’ busy lives make fitting in appointments at restricted times quite tricky. So we wanted to go the extra mile and create something special! In October 2016, we were delighted to open the doors to our new Cats and Exotics Branch on Duke Street – literally a stone’s throw from our Stanhope Road Hospital, but a completely separate building, allowing us to provide a unique dog-free zone for cats and exotic species. We are also very honoured that we have been able to achieve “Gold Standard” Cat Friendly Clinic status – the highest accolade awarded by the International Society of Feline Medicine (ISFM), and we are currently the only one in County Durham! 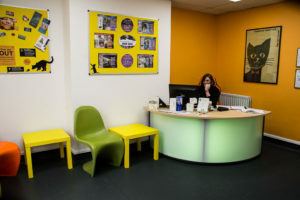 At our Duke Street Clinic, we have two separate waiting areas – one for cats, and one for exotics. This helps to reduce stress between the different species whilst waiting for appointments, by minimising sight, sound or smell of each other. When you arrive at the surgery, you will be invited to place your cat’s basket on one of our tables in the waiting room, where your cat will feel less vulnerable as they will be able to observe their surroundings from a height. Whilst waiting for your appointment, one of our friendly receptionists or nurses will place a towel over your cat’s basket. The towels have had a light spraying of Feliway prior to the start of our consulting times – this is a synthetic Feline Facial Pheromone, scientifically proven to help reduce feline stress by giving a chemical message of familiarity and security. We have found that many of our cats relax significantly under the security of the towel following the journey to the practice, prior to seeing the vet. Each cat will get a clean towel, so rest assured, there is no contamination between pets. We also have a Feliway diffuser plugged in at all times in the waiting room, to produce a constant calming pheromone to help reassure the cats whilst waiting. Once the vet is re ady for your appointment, you will be shown through to our cat-only consulting room. The room is spacious and private, allowing your cat to be examined in calm surroundings. 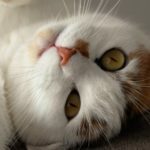 Our staff have been trained to use “Cat Friendly” handling techniques, so our vets will most likely place the basket on the floor with the door open, allowing your cat to come out in their own time, and have a little nosy at their surroundings if they wish! For more shy cats that are too worried to come out of their basket, we may be able to perform most of the examination whilst they sit in the bottom of their basket (if the top can be removed) – we can advise on suitable “Cat Friendly” baskets and ways to minimise stress when transporting your pet. Our appointment slots have been extended to 15 minutes as routine, allowing the vets to perform an examination at a gentle pace to reduce anxiety in your cat. We will use your Feliway-sprayed towel from the waiting room, to place on the examination table for a warm and soft surface, which will now have also picked up your cat’s own familiar scent, to again boost self-reassurance. Once again, a Feliway diffuser is plugged in at all times to help reassure our furry felines! At the Duke Street surgery, cats have there very own quiet ward at the back of the building on the first floor. We have invested in uniquely designed “cat cubes”, built specifically with cat friendly principles in mind. 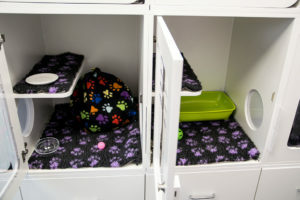 The cubes are constructed or an opaque laminate material, making them warm and quiet, in contrast to the traditional stainless steel kennels, which many cats found scary due to the noise and reflections from the metal surface. Each cube also has its own built-in resting perch, giv ing the patient that all important vertical space that cats need to survey their surroundings. 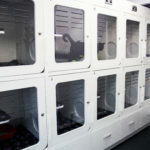 The cubes are all sited along one single wall, so that cats cannot see each other and feel threatened, with the option to extend adjacent cubes to give the patient extra space during their stay (see picture on right). Each cat gets their own cosy bed to hide in and feel safe, and we have a range of bowl types and foods to tempt even the pickiest of felines! We also provide a choice of cat litters as we know how some cats have strict preferences for the types of litter they will toilet on. 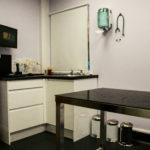 Our cat ward also has an adjoining examination room, allowing us to examine patients, take blood samples, and give medications out of view of any other cats. Again, we use Feliway in our cat ward – sprayed in the kennels prior to being occupied, and also as a plug-in diffuser. We also play “Music for Cats”, which is a classical type music designed to promote relaxation of cats, to help settle them into the hospital environment. Our modern operating facilities have also been designed with our smaller patients in mind. 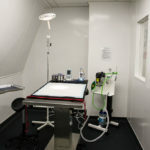 Our theatre boasts a heated table top to help maintain body temperature during surgery, as anaesthetised patients are unable to self-regulate, and small patients such as cats lose heat much quicker than larger animals, leaving them vulnerable to hypothermia. We can perform most surgeries at the Duke Street clinic, however, more complex surgeries, or procedures requiring imaging diagnostics such as x-ray and endoscopy, would be carried out at our main hospital on Stanhope Road. We have modern dental facilities, comprising an ultrasonic scaler, electric drill and polisher, which are kept separate from the operating theatre to prevent the spread of airborne bacteria to surgical cases. Once again, a Feliway diffuser is in use at all times in this area, to help reassure the patient whilst being anaesthetised or during other procedures. Meet Sue, one of our Registered Veterinary Nurses. Sue has been at Stanhope Park Veterinary Hospital since December 2001, and over recent years has developed a keen interest in feline specific veterinary nursing, especially the behavioural aspect of this species. Sue has recently completed the ISFM Diploma in Feline Nursing, and is our appointed Cat Advocate. 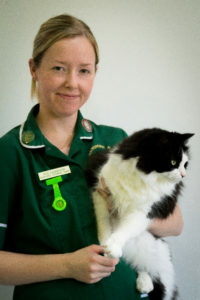 This means that she is responsible for ensuring that the necessary ISFM Cat Friendly Clinic criteria are met and that all staff are correctly trained in Feline Friendly handling techniques and nursing care. She also ensures that Cat Friendly practice protocols are put in place and followed. 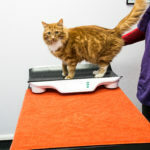 At Stanhope Park Vets, we are very proud to be able to offer these facilities to our feline friends, and have already seen a huge improvement in the stress levels of many of our cats visiting the practice, be it for a routine booster appointment, or when staying with us for a surgical procedure. Whilst many of our long-standing clients may be happy to continue to visit our Stanhope Road Hospital, we would encourage owners to use the new Duke Street clinic wherever possible, as the benefits to your cat can only be positive! We look forward to seeing you and your furry felines! For more information on our facilities or to book an appointment at our Cats and Exotics Clinic, please call 01325 620968 or email Stanhope Park Veterinary Hospital at info@stanhope-vet.co.uk.